The hipster city of Brighton showcases so much stunning street art that it’s more than enough to lick one’s chops. St George’s Mews, in the North Laines, is like an open-air gallery but there are examples of graffitis and wall paintings almost everywhere, including the decorated old phone junction boxes. Some of the bright graffitis have been painted by well-known street artists like Banksy, Snug, Aroe and Odisy, other murals were created by less famous albeit great illustrators about which I could not find any reference to their identities nor the title of the paintings. The anonymity doesn’t matter. The scenes are beautiful and striking. And the overall quality of Brighton street art is higher than the one found in Berlin East Side Gallery. 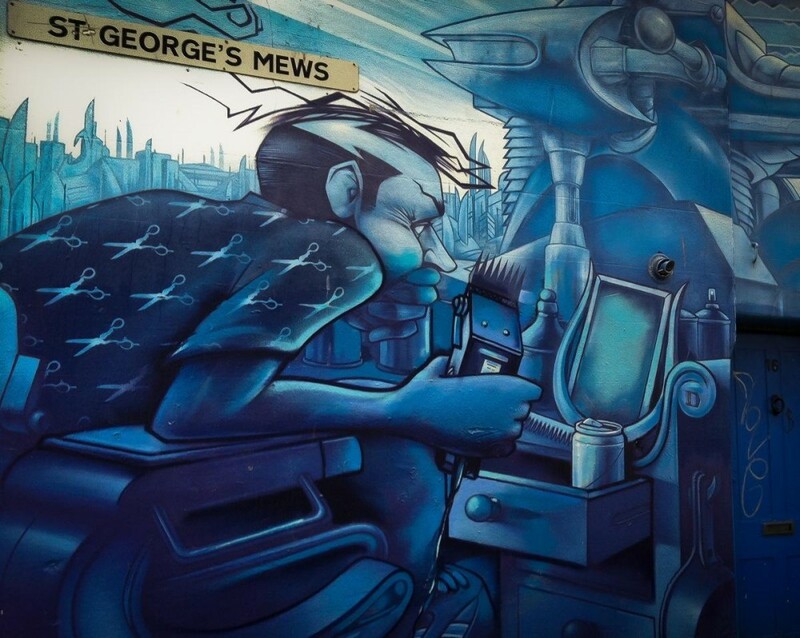 It took him months to complete The Hair Cutter, the stunning mural realized for a hairdresser along St George’s Mews. Snug has a longstanding presence on the street art scene and his talent was recognized and appreciated also by important brands like Hugo Boss and Absolute Vodka, for which he produced corporate artwork. Some call him ‘the perfectionist’, for the extreme care Snug puts in his work, making him an acclaimed muralist. Painted in 2008, this huge impressive mural stems from the collaboration between Odisy and Aroe, two well-known British street artists. Locals call it the Run DMC Mural, from the legendary American hip-hop Group that had such a great influence in the developing of the hip-hop culture in the 1980s. 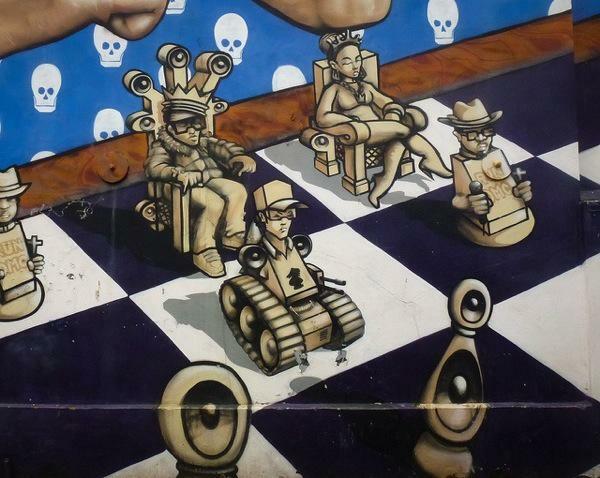 The mural features Jam Master Jay playing chess and contemplating next move over a black and white chessboard where some of the pawns represent other members of the Run DMC band as well as the famous American rapper Rakim. Head to Kensington Street in the North Laines to admire this huge and impressive mural, covering the back of two big buildings. Although the attempts to set up his identity have been unfruitful up to now, there is no doubt that Bansky, with its peculiar stencilling technique and the frequent political and social themes represented in his works, stands out on the British street art scene. 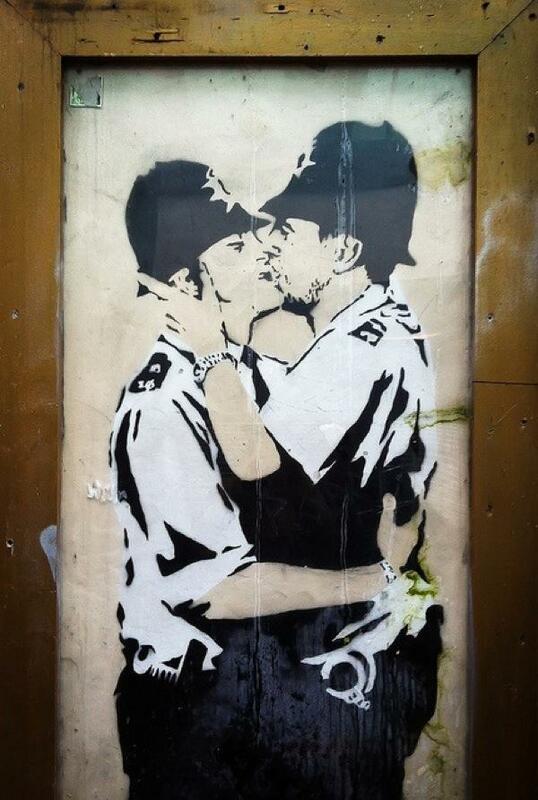 Banksy provocative Kissing Coppers is a little out of the way, close to Brighton Railway Station in 48 Trafalgar Street. Recently, Banksy added to his collection two new stencils whose theme is related to the London Olympics although their location (you can see them on his website, though) has not been revealed. 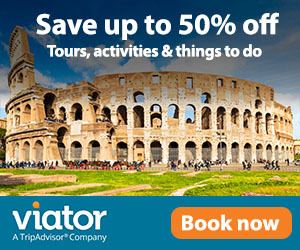 Did anyone spot them in London and in this case, would you tell us where they are? The graffiti scene is so rich in Brighton that one could spend days and probably wouldn’t be able to see it all. Bright colors, catchy themes, references to people who influenced modern culture, music or politics, paintings that tell a story and others that seem more abstract. Enjoy the rest of the photo tour! 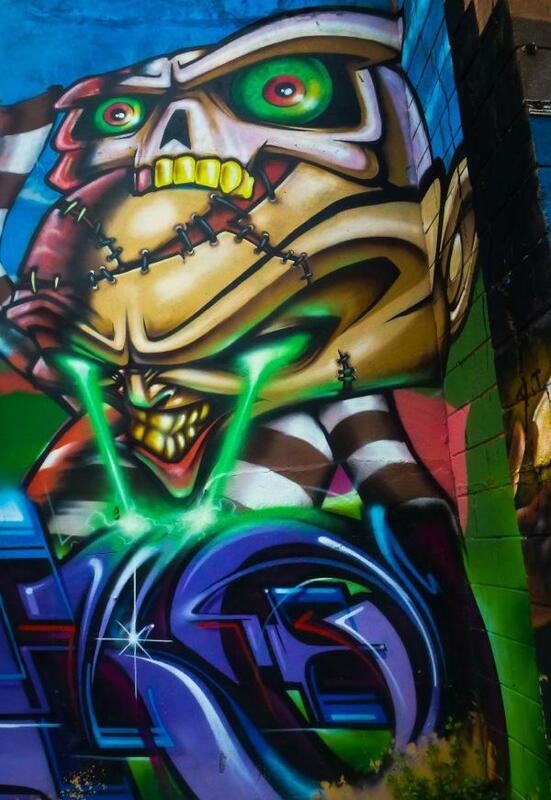 Have you visited Brighton and seen its stunning graffiti? 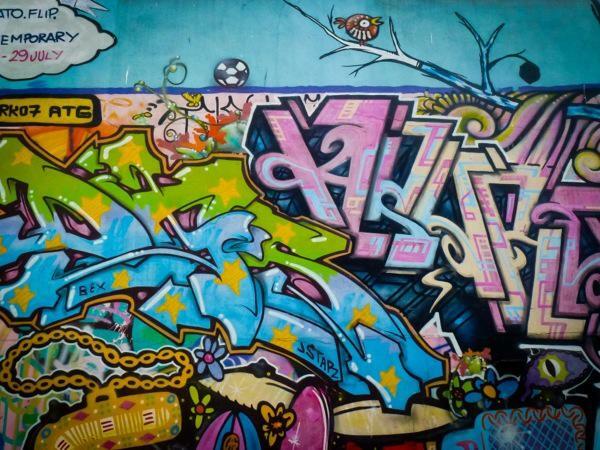 Do you think street art is a form of art or mere vandalism? When to go: Brighton can be visited any time of the year. However, if you want to avoid the crowds, score better prices and have a rather different sight of this well-known sea resort, you might enjoy the charm of Brighton in Winter. Where to stay: Conveniently located on the waterfront and close to the main Brighton activities, restaurants, and bars, UMI Hotel is a good option for travelers looking for a budget but comfortable accommodation. 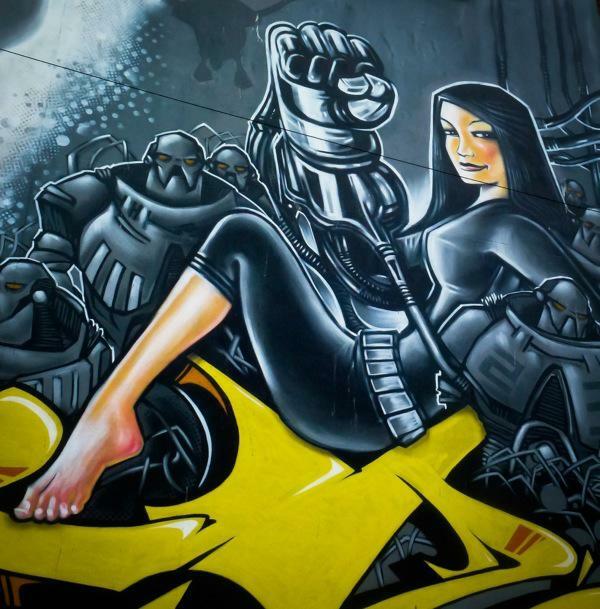 SNUB has become known for his futuristic murals, inspired by fictional robot Hammerstein; who is featured in one of the artworks photographed above. Lovely photos and a real inspiration. 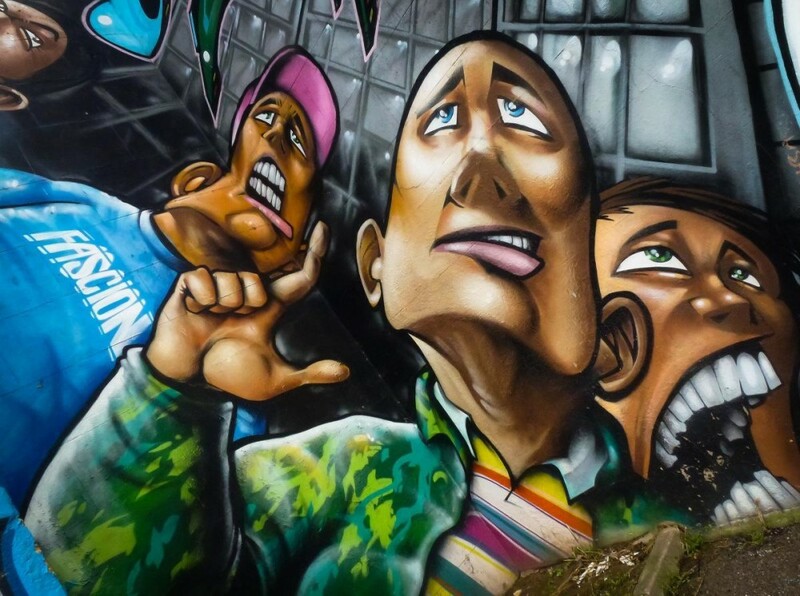 We’re started collecting our own images of Brighton’s diverse street art scene on a new website at the link above. Thank you for stopping by and commenting. I’m glad you liked the photos. as for me, I look forward to go back to Brighton soon and see more of its amazing street art scene! Absolutely stunning! I’m really digging your graffiti photography. Awww… Thanks so much, Sonya. I’m so glad you liked the photo essay. All of a sudden, I got a thing for street art 🙂 More to come soon! Great photos, Brighton is a place always close to our heart as Gray (my husband) grew up there. It’s such a vibrant city and we always make sure we visit every few months. Thank you, Becky. I had such a wonderful time in Brighton and hope to be back soon. Fantastic post & pics, Simon. Kudos to Brighton for encouraging the arts and kudos to shopowners who sponsor the artists and supply the ‘canvas’. I love the injection of contemporary energy into tired spaces. Great stuff! Thank you, Lesley. I wish more cities would follow the example of Brighton, it would add so much more color and charm! I get back to Brighton (home town) whenever I can and was there Sunday checking out some street art. Love your shots so vibrant. The original Kissing Coppers was sold to the States last year more here http://bit.ly/QR1sRM Not sure I agree with that…. Oh, thanks so much for commenting and letting me and all readers know about the sale of the original Banksy Kissing Coppers. I was not aware of that… I hope to be back to your home town soon. Such a vibrant little city! I love the artwork there. Some stunning stuff. I live 25 minuets drive down the road from here and took my 4 year old boy to take some photo’s of the amazing artwork in Brighton. This is done in collaboration with the local Council and highlights why Brighton is what it is. There is some amazing stuff going on in the UK around street art. exception to the rule anything by banksy! 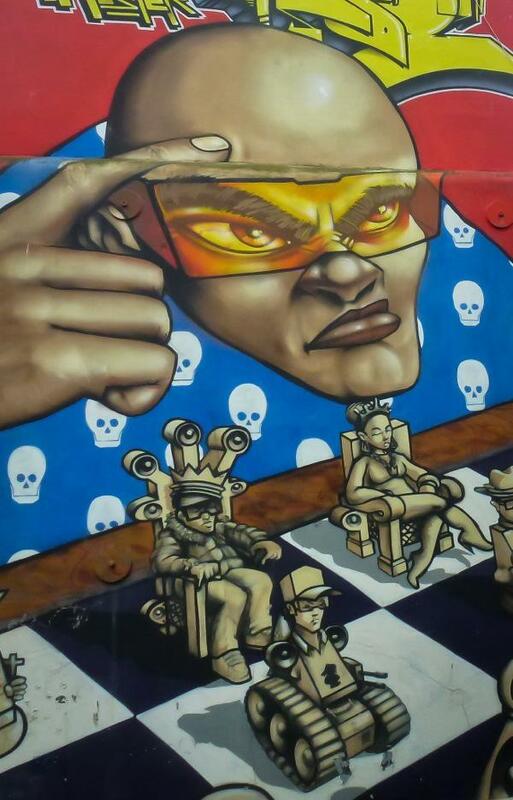 Stunning street art and great photos, Simon! There are some very talented people out there – agree with other comments that this is art and doesn’t feel at all like graffiti. Totally agree with you, Leigh. This is a form of art and every day I discover new talents around me. It’s such a wonderful feeling. That is art; the stupid gang messages on my fence not so much. Fantastic art! 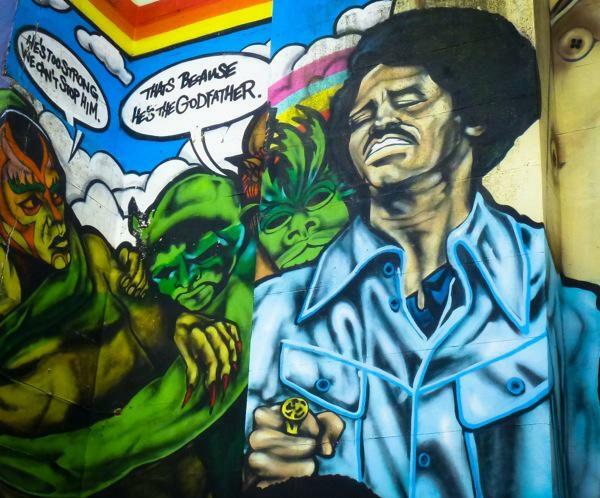 Makes me want to get out and see if Austin has any graffiti of significance. Safe Travels !!! So glad you liked the graffiti! No idea though if you can find any of them in Austin 🙂 Let me know! I must admit that I knew nothing about Banksy before visiting Brighton (and it’s definitely the place that fueled my passion for graffiti) and as it’s in an off-beat street I wouldn’t have seen it without our Brighton Greeter. The man was passionate about history and art and he was a true goldmine of information! I never appreciated graffiti until I found this one post which you wrote. Loved these ones. Thank you, Franca. I’m so glad you liked the photo tour. I have become a huge fan of street art! Wow, those are awesome photos. 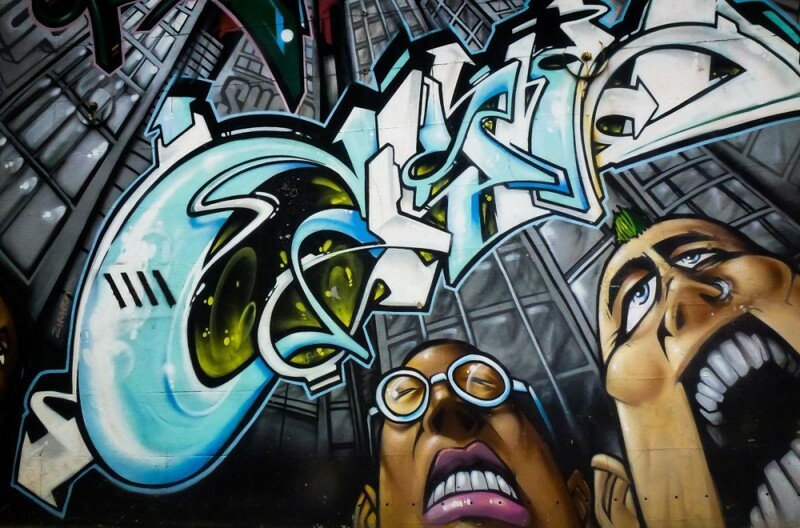 I have no doubt these graffiti scenes were even more incredible to see in person!